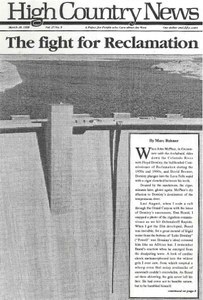 A 1965 Bureau of Reclamation booklet declaimed the glories of building Glen Canyon Dam. A plan to let the Colorado River flood for one week through Grand Canyon is delayed, to the chagrin of environmentalists. Despite evidence it's a boondoggle, Southwestern Colorado's Animas-LaPlata is still slated for construction in order to meet treaty obligations to Ute Indian tribes. The Department of Energy publishes a book, Closing the Circle on the Splitting of the Atom, about the problems of nuclear waste disposal. The General Accounting Office finds that the Forest Service overestimates the number of trees it can cut from Northwest forests. The Stories that Shape Us: Contemporary Women Write about the West offers essays by 26 writers. Spring visitors, new interns Elizabeth Manning and Karen McDonald, odds and ends. Wyoming Governor Jim Geringer vetoes bill that would have placed $1,000 bounty on wolves shot outside Yellowstone National Park. Recent survey shows that 58 percent of Hells Canyon area residents support protecting the area's natural environment, even if jobs are at risk. Mescalero Apaches reverse themselves and vote in favor of storing radioactive waste on their New Mexico reservation. The Animal Damage Control program accidentally kills one of Idaho's newly reintroduced wolves in a coyote trap. Department of Interior delays deadline for resolving a dispute over R.S. 2477, which encourages road building on public lands. A subdivision in southwestern Colorado allows buyers to build houses around Anasazi ruins. A planned Kenetech wind turbine site in Wyoming may endanger the raptors that hunt and migrate in the area. Federal attorneys sue Nye County, Nev., for claiming that Nevada owns public lands. Some of the wolves reintroduced to Yellowstone are trying to breed. Gunnison Forest Supervisor Bob Storch creates another access controversy in western Colorado by giving a road-plowing permit.